Rivers that discharge into the Severn Estuary are very different from most UK rivers. 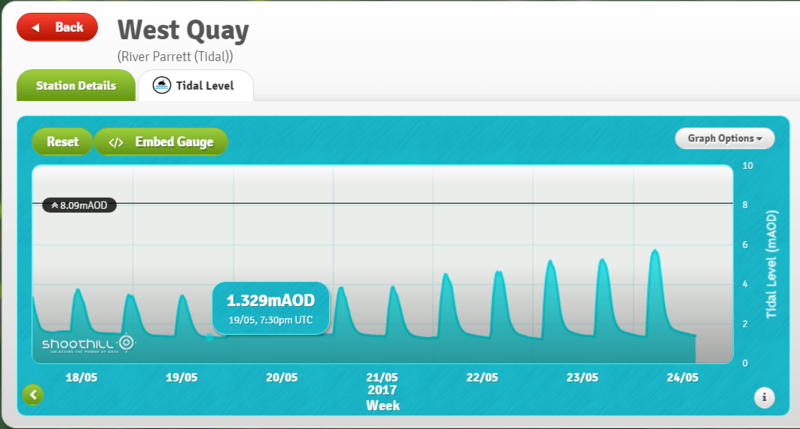 With a tidal range in the estuary of around 11m MLWN -3. 0 and MLWS -5.7 AOD and the river bed level at around 0.00 AOD. 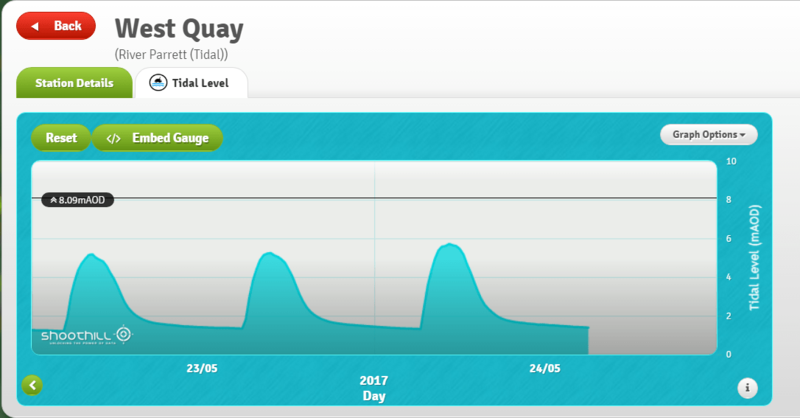 These levels means that at low tide in the estuary the water level is always below the bed of the River Parrett and the river simply empties into the estuary. In the case of the Parrett its a process that goes as far upstream as Oath and the changing tide sees the river refilling from the sea. 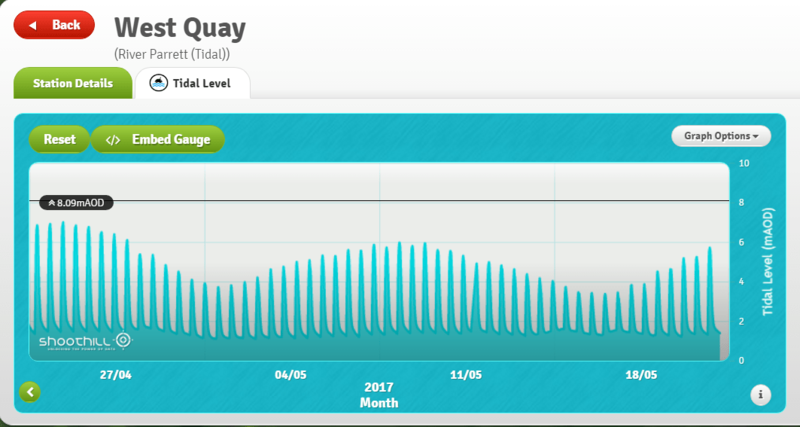 What is seen looking over the Bridgwater’s bridges is just one half of the normal tidal cycle you would see at the coast; at low (ebb) tide its purely fresh water going out and that can be seen on the West Quay tidal gauge where the graph flattens. 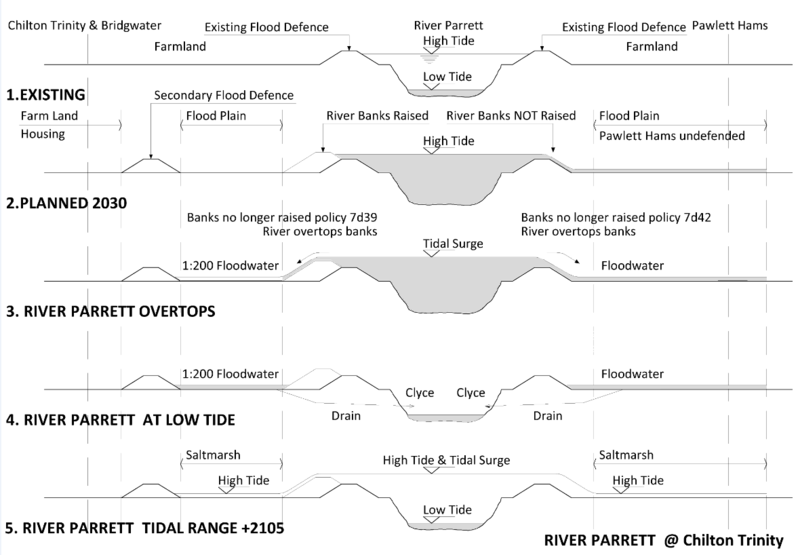 Equally the point at where incoming seawater (saltwater) takes over from the freshwater of the Parrett and becomes a relatively small component of the rivers water can also estimated. At low tides the river empties so completely that during periods of low fluvial flow it can actually dry out so much so that upstream of Combwich there is an old iron age path where people simply walked across the river at low tide. High tides can be nearly 2m above the surrounding land and at Bristol Road nearly as high as the head of the doors and over the next hundred years that will continue to grow . Ecologically it is largely a dead river. Nature likes, however bad, a consistent environment and the Parrett offers the greatest of changes twice a day from empty to full and freshwater to saltwater. The large amounts of Seven Estuary silt that arrives with the tides exclude sunlight and there is nothing to generate oxygen. Fish(salmon) and Elvers just transit the river on their way to the fresh water of the River Parrett and its tributaries. It is a true challenge for The EU Water Framework Directive as there is little negative actions that can be done to it. The lack of water does not deter unrealistic claims that fisheries exist in the river. 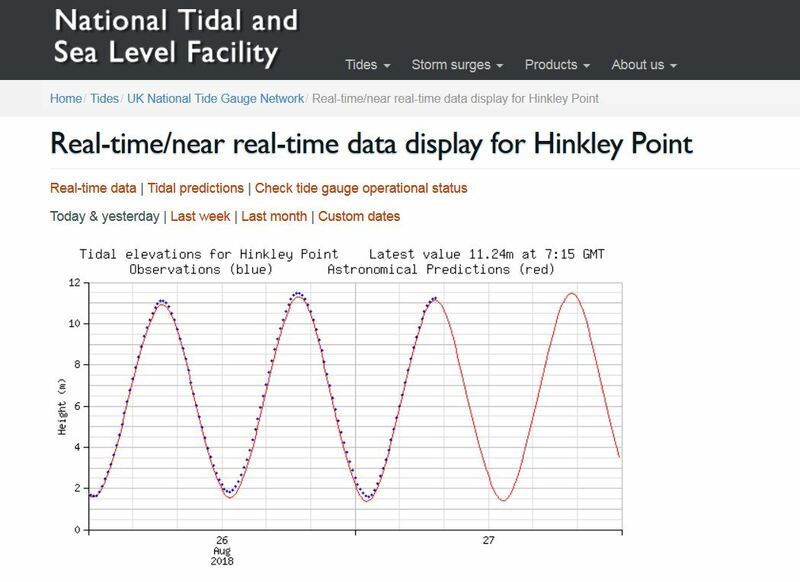 The Hinkley Point tide gauge above shows the full cycle of the tide in compoarison to the truncated cycle at West Quay which is caused by the river bed being higher than the sea bed in the Seven Estuary. 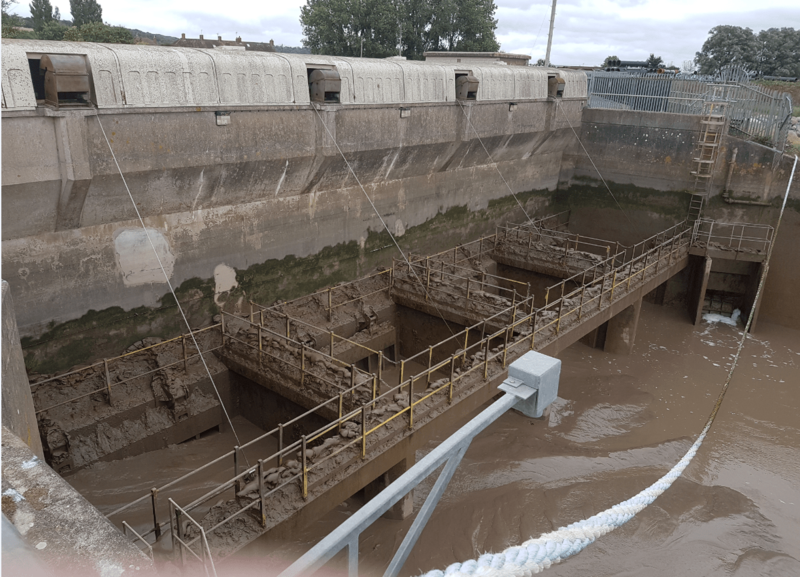 In 2014 the Somerset Levels flooded, normally excess water is stored on the levels and then pumped back into the river when the weather improves and fluvial flows have reduced. The floods occurred because the flood storage capacity of the land was exceeded. The response to the flood and still the current plan is pumps some more fixed ones and temporary platforms for hired pumps such as the permanent platform at Dunball made ready for the next time the levels flood and improvements made to how fast the flood water can be drained off the Levels. One important question is whether its possible to increase the amount of water that flows down the river without pumps? The answer is yes; the Thames Barrier is used in that way when there is flooding and the Thames and its tributaries are at capacity. The barrier gates are closed at low tide creating a shallow reservoir normally filled by the incoming tide and floodwater coming down the river fills it up. 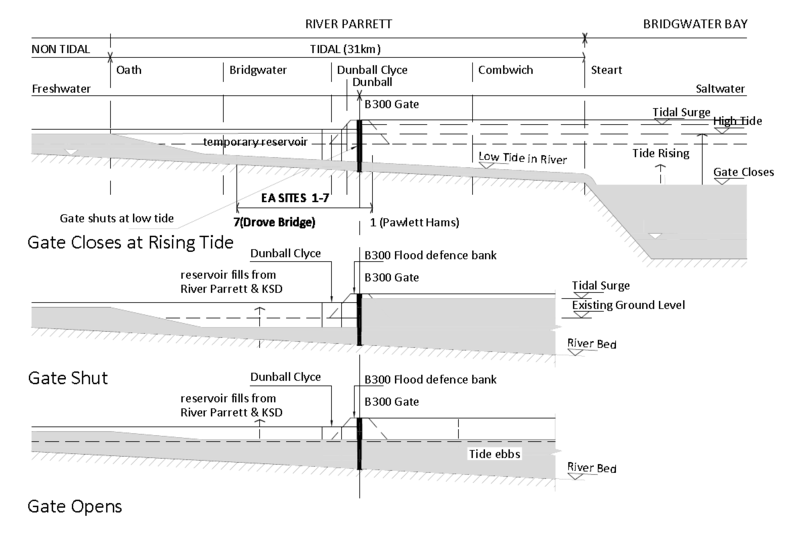 Previous references to the Thames Barrier and the River Parrett were in relation to the type of gate rather than how the system operates. How might it work in the River Parrett? There are two sources of fluvial floes into the Parrett. The Parrett and King SedgemoorDrain (KSD) /Sowy River. Water unable to get down the River Parrett is diverted around Bridgwater via the KSD/Sowy and re-enters the Parrett at Dunball. Both sources can discharge when the tide is out but become tide locked when the sea re-enters the river. 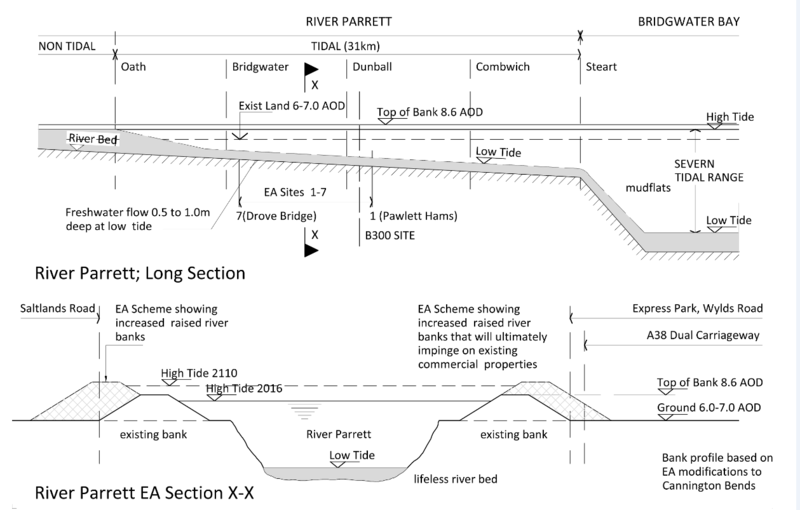 Creating a large temporary empty length of river downstream of Dunball would allow both sources to continue flowing and when full and matched with the tide allowed to go to the sea. To do this a gate is needed downstream of Dunball and the best location would be Combwich or somewhere in between. The Bridgwater Tidal Barrier is a gate that could have been used to do this. 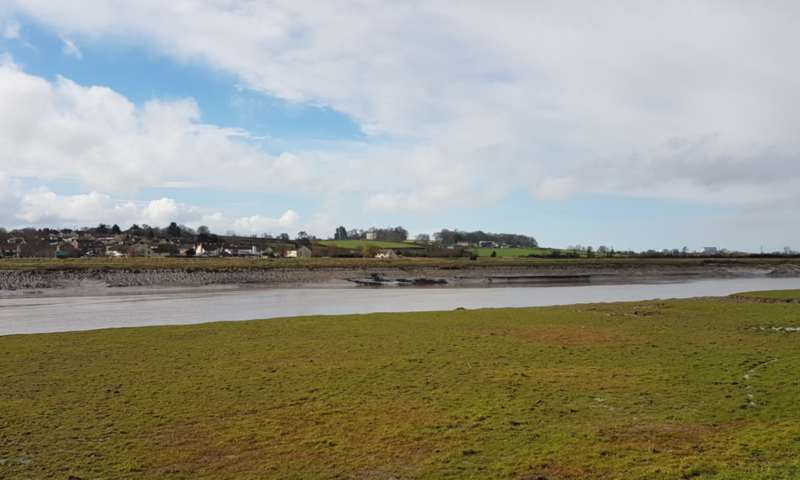 The current plan is to build the Bridgwater Tidal Barrier upstream of Dunball Clyce and with sea and tide levels continuing to rise allowing the sea to reclaim the farmland at Chilton Trinity and Pawlett Hams. The existing system returning to an inter tidal saltmarsh/mudflat covering the existing farmland at Pawlett Hams and most of the land to the north of the village of Chilton Trinity. The drawing below shows how the regime will change over the years to come.